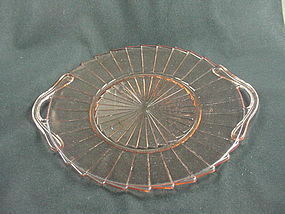 Sierra - sometimes called Pinwheel by collectors - was produced by Jeannette Glass Company from 1931 to 1933. The delicate pointed rims make it a challenge to find without damage. For those who are up to the challenge, here's your reward: Offered here is the 10 inch handled sandwich plate in pink in excellent condition - no chips! I have 2 available, price is per plate. See my other listings for more in this pattern.